In a move that comes as no surprise, Erin Andrews is leaving the sport that was the backbone of her rise to fame. Sports Illustrated’s Richard Deitsch reports that EA will no longer be a part of Fox’s college football coverage, where she served as the host of the ill-fated Fox College Saturday. Logistically, it would have been near impossible for Andrews to do both hosting duties for college football and report from the top game site for the NFL every week. Her promotion to the #1 sideline reporter for the NFL on Fox meant that her future with college football was always going to be placed on the backburner. It is final confirmation of what could be described as nothing but a disastrous tenure for Fox College Saturday, a program that couldn’t even make it to a second year. Fox Sports 1 created mega expectations for the show by going head to head with College GameDay at 10 AM on Saturday mornings and by placing former ESPNer Andrews at the front of their effort. They said to the world they were ready to challenge GameDay and ESPN directly and compete on that level. They were miles off the pace. Fox College Saturday’s viewership fell short of GameDay by a ratio of 25-1. Had Fox not created those expectations, perhaps the narrative on their network and reality of the situation would be much different. That’s not Andrews’ fault – she was put in a no-win situation by the network, who thought that her presence alone would siphon a major portion of GameDay’s audience away from ESPN. However, it is something of a disappointment for EA considering she left ESPN to expand her career and move beyond the sidelines. Now after a couple years at Fox, she finds herself out of the anchor desk and back on the sidelines. 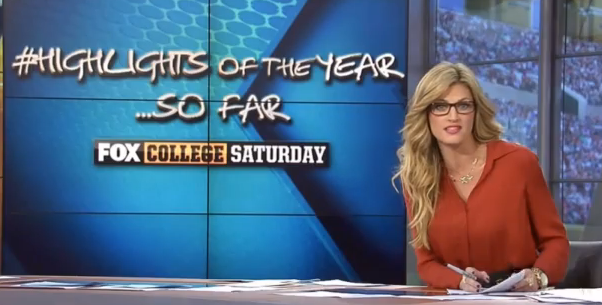 Finally, don’t expect this to be the end of the changes for Fox’s college football coverage. As Deitsch published his piece, we were also hearing from a well-placed source that Andrews’ departure from the college football realm is just one change of several that could be in store for the coming season. This includes talent and the still-uncertain future of any kind of Friday night/Saturday morning pregame show. Fox Sports 1 knows they need to drastically rethink their college football coverage and is basically starting over again in Year 2. Watch this space for more details.